Why has there been a sexual abuse investigation at BJU? Why aren’t there any court cases? Why are you tarnishing the reputation of Christ before a watching world? We all just need to forgive. Why are you so unforgiving? Why don’t you give the benefit of the doubt? These things happened so long ago. Why are you bringing them up now? Why aren’t people showing grace? But aren’t all sins equal? How can you be so disloyal to your alma mater? Matthew 7:1 We shouldn’t judge. Matthew 18 You should go to your brother in private instead of posting publicly like this. I Corinthians 6:1-8. Christians shouldn’t take other Christians to court. What is it we want? 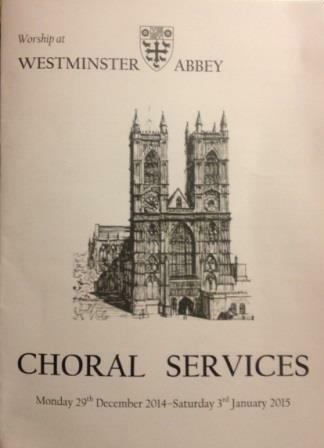 It was time for Evensong at Westminster Abbey on December 29, 2014. The crowd was sitting in their seats, all bundled in coats, scarves, and gloves. We were all gazing in wonder at this beautiful centuries-old place of worship, when the Royal School of Choir Music from America entered. I leaned forward in anticipation of a reverent service punctuated by beautiful music. This was an evening to remember “The Holy Innocents” — the infant children, specifically the Hebrew boys ages two and under who were slaughtered by Herod’s henchman many centuries ago when Jesus was born, as promised, in Bethlehem. As I listened to this hauntingly beautiful and foreboding lullaby echoing in that ancient space, my imagination was sparked and my emotions were deeply stirred. The Dean of Westminster Abbey read passages from both the Old and New Testaments, specifically referencing the sorrow and suffering that pierced the hearts of many. He went on to mention that now, in our day, there are horrible injustices still happening to children around the globe. He paused and prayed for these innocents who are suffering in our world at this moment. I sat there imagining that long-ago scene, realizing the significance of hearing that we have a God who is indignant when children are hindered from coming to him. And there are numerous ways children can be hindered — through neglect, through pressure to focus exclusively on the material world, and most certainly the worst of all, through life-shattering experiences of abuse – spiritual, physical, psychological, emotional, and sexual abuse. Until our hearts are moved by these injustices, very little, if anything, will change. God’s love moved Him to act. He started by sending His only son to this earth as a vulnerable infant so He could dwell amongst us. What is the love of God calling us to do? See. Pay attention to the vulnerable innocents in our everyday lives and do all we possibly can to protect them. Listen. Listen to the voices of those whose lives have been turned upside down, inside out, and shattered. Pray, beginning with prayers of confession. Confess the woeful neglect that has been happening on our watch. Grow up. We must put aside our natural awkwardness, our fearful squeamishness, and stubborn naiveté. Repent. Our indifference and arrogance are as fatal as an aggressive cancer. And lastly, SPEAK — let’s tell the truth. Let’s lovingly but firmly confront those who would rather walk away from the mirror of truth looking exactly like they did at first glance. As I walked away from the Abbey that evening, the ten bells were pealing so loudly and gloriously that the sound sent chills down my spine. I stopped in my tracks and listened. It was as if the bells had two messages: One was urging us onward and outward into the cold night with the fire of compassionate love burning in our hearts compelling us to seek and find in order to help the hurting. The other message? An indignant, striking sound of warning to anyone who would DARE to obstruct the path of relationship between an innocent child and our Holy God. This was beautifully written. Thank you for sharing both the powerful experience and the powerful thoughts it evoked. This was a blessing. Thank you, Cindy! It felt like a confirmation to continue learning, caring, and speaking about this topic. We welcome your comments, with certain guidelines and restrictions. Please see the Blog Commenting Policy page above.